A new-build 33 metre Custom Line Navetta motor yacht has been sold to a German client by Torsten Sieckmann at Sieckmann Yachts. Designed by the Ferretti Engineering Department working in collaboration with Zuccon International Project, this new 33 metre tri-deck yacht is scheduled for delivery in Spring 2020. She features a bulbous bow for greater stability and seaworthiness, while the maximum range of 2,000 nautical miles means that owners can look forward to extended cruises around the Mediterranean and beyond. Accommodation is for up to ten guests split between five staterooms, including a full-beam owner’s cabin on the main deck. A fold-out terrace provides great views out to sea from the main deck saloon, while the upper deck features sliding windows, allowing this area to be opened up to the elements. Another star feature is the sundeck, which boasts a spa pool and a large sunbathing area. Particular attention has been paid to reducing noise and vibration levels on board, with a flexible joint in the transmission lines to absorb shaft vibrations. Hydraulic fin stabilisers are fitted as standard. Twin 1,400hp diesel engines from MAN will enable a top speed of 16 knots and she will be fitted with Seakeeper zero speed stabilisers. 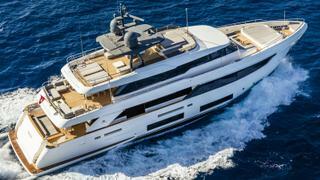 The asking price of the Custom Line Navetta 33 has been withheld.